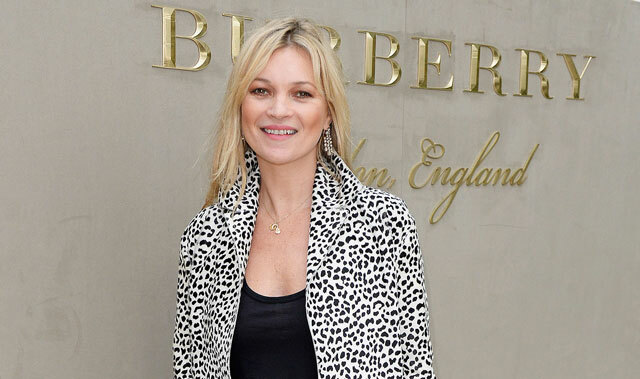 Kate Moss Turns to Interior Design - Wow! KATE MOSS, THE BRITISH SUPERMODEL (WHO NEVER SEEMS TO AGE! ), HAS TRIED HER HAND AT FASHION DESIGN, ACTING, SINGING, AND NOW INTERIOR DESIGN. 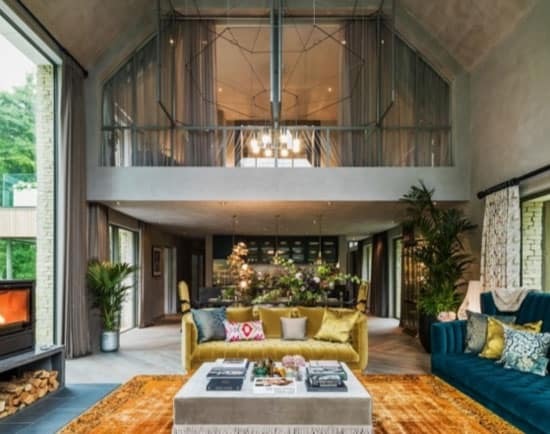 Her first interior design project took place in a housing development in Cotswolds, UK. Set in the heart of the English countryside, this property is only a 90 minute drive from London, making it the perfect get-away from the busy city. This country retreat, known as The Barnhouse, is part of The Lakes by Yoo, a luxurious second home development. The stunning five bedroom home is situated on an acre of it’s own private land, surrounded by a beautifully lush forest, and a spacious outdoor deck that is superbly complemented with a pool and large retractable doors. With plush velvet sofas and leafy greens, this room brings the outdoors in. Utilizing earth tones (this season’s most trendy color scheme), houseplants, and amazing floor to ceiling windows, this room creates such an opulent and natural feeling that it would be a great place to unwind from the pressures of city life! 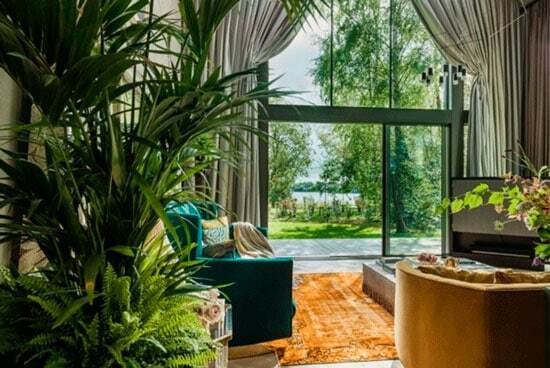 While the view to the bedroom above shows a contemporary vibe, with its open plan design and floor-to-ceiling windows, the home’s decor also has inspiration from the 1920’s, 1960’s, 1970’s, as well as a bit of Moss’ own unique taste and style. With The Barnhouse’s extremely high ceilings and mostly gray color theme, Moss adds a pop of color with the ‘70’s inspired royal blue and mustard velvet sofas and burnt orange velvet rug. Moss chose the luxurious silver and gray, velvet-looking carpets, as she was inspired by the surrounding silver birch trees. She wanted to feel as though the nature around the property was a part of the decor. To achieve the exact look she was looking for, Moss hired local craftspeople to custom make furniture and decor, aiding in the uniqueness of the home. For example, this four post bedframe was commissioned by David Haddock, a local craftsman, who also helped Moss with a number of other exclusive pieces for the property. 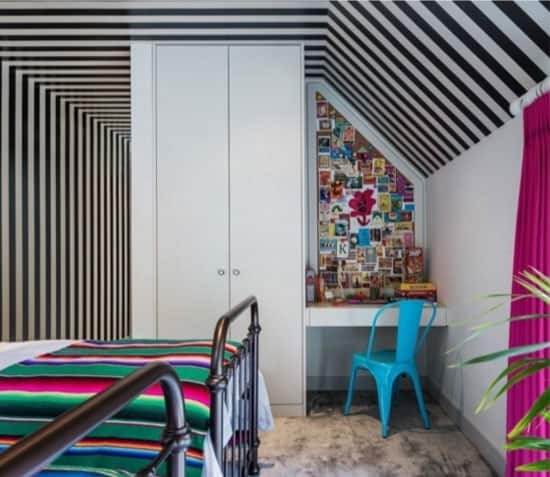 Local designers were also tasked with creating bespoke pieces for the home, including wallpapers and fabrics by House of Hackney, which Moss cleverly matched her Olivia Von Halle striped PJ’s. The Barkhouse is full of amazing art throughout the home. Some of the artists featured include: Allen Jones, Chris Levine, Damien Hirst, Mit Senoj and Kate’s own collaborations with Jake and Dinos Chapman, and Chris Allen. If you are interested in buying this property, it’s only 2.5 million pounds…..! 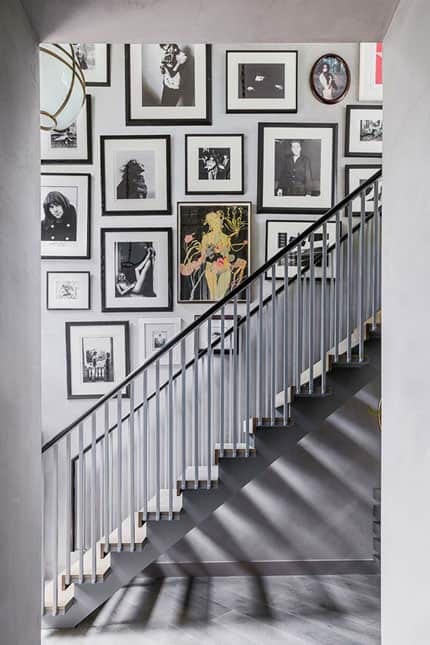 KATE MOSS’ INTERIOR DESIGN STYLE- LOVE IT OR LEAVE IT?